Transportation of harvesters by road is the best way to move this equipment over long distances. It is obvious that it is impossible to transport it through Europe, Ukraine or Central Asia. In this case, transportation of the combine will take too much time. Therefore, a trawler is used to transport harvesters and other specialized equipment. The route is carefully calculated. If it includes passage under bridges, crossing railways, then logistics becomes more complicated. It is necessary to calculate the route so that there are no difficulties due to the height and its overall dimensions. Thus, transportation of harvesters is carried out in compliance with the speed regime, special trailers are used – trawls. This allows you to deliver the goods to the endpoint in safe mode and just in time. Calculation of the cost of services specialists Optimal Logistic is performed taking into account several factors. So, the cost of transportation combines affects fuel consumption, moving on toll roads. At the request of the customer, the route can be built without traveling on toll roads. But in some cases, this is the only and best option.It is important to envisage crossing of state borders, payment of fees and duties. All costs are calculated in advance and the customer is presented with a final price, which will not be increased. However, the cost of the services does not require large-scale expenses on the part of the customer. 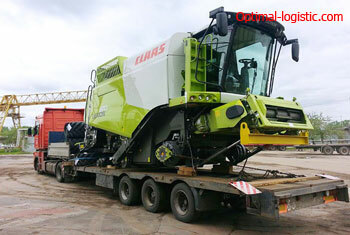 After all, the company’s logicians will choose the best route, and experienced drivers will ensure the timely delivery of the combine.